Remember this? 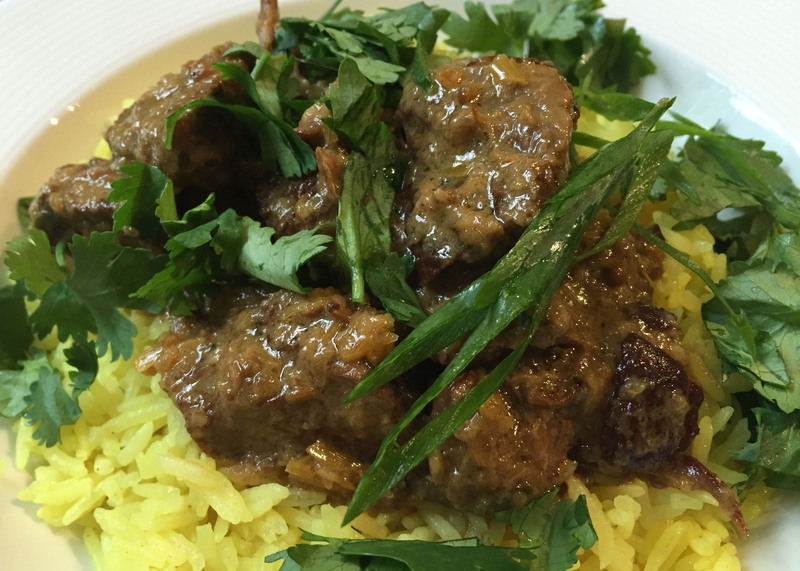 http://auntieeats.ca/2015/01/lamb-popsicles-with-indian-curry-sauce/ One of my favourite dishes from one of my favourite restaurants. I own all of Vij’s cookbooks. Many of the recipes have become favourites and now you get to try another one… sort of. 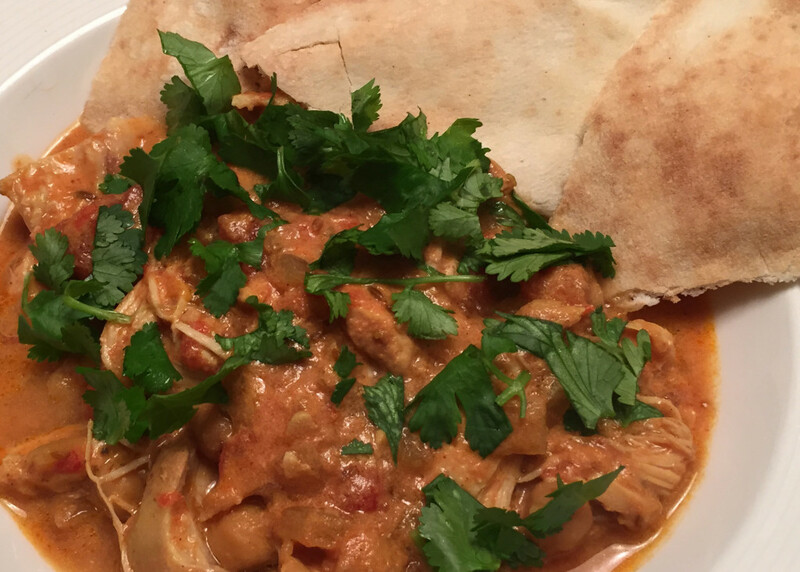 This recipe is based on Vij’s Family Curry but I have adapted it substantially to make it healthier (subbing in chickpeas for a large portion of the meat and cutting back on the fat), and easier (hello boneless skinless chicken thighs and sloooooooow-cooker). Don’t worry, it still has the same deliciousness as the original, but with much less hassle. The original version of this recipe is a regular “birthday-dinner” request of my second-oldest Niece. I wish I still lived close enough to my “middle” nieces to cook for them on a regular basis but since I don’t, I’m hoping my take on one of their favourite meals is so much easier that they will someday make it for themselves (do teenagers cook for themselves? I’m not sure but maybe they’ll give it a try). This makes 4 servings (Husband and I for dinner with leftovers) and you can easily double the recipe if you wish. In a large pan heat oil on medium heat, add onions and cinnamon stick and sauté until the onions start to turn slightly golden (about 5 minutes). Add chopped garlic and saute another minute. 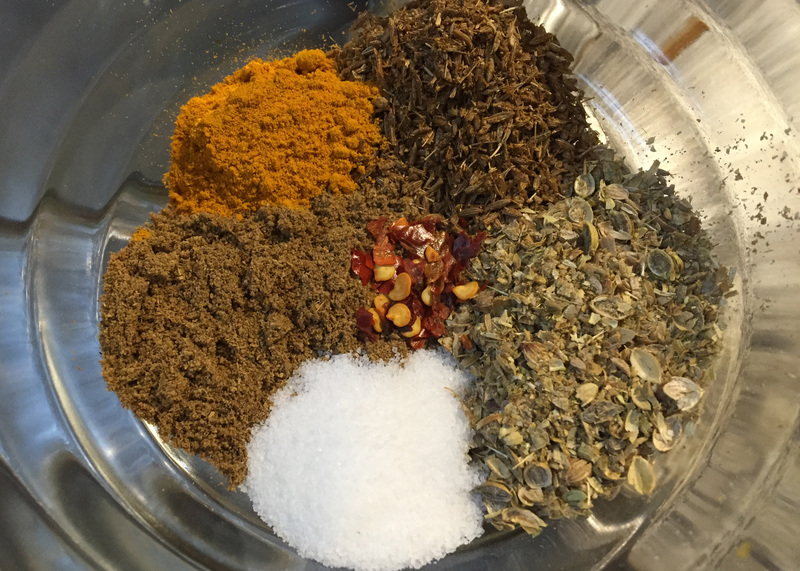 Add ginger, tomatoes, salt, turmeric, cumin, coriander, garam masala and cayenne or red pepper flakes. Cook for 5 minutes, stirring a couple times and breaking up the tomatoes with a spatula. Stir in the chickpeas and the chicken stock. Nestle chicken thighs into the sauce. Cook for a more couple minutes, turn over thighs and cook for a couple more minutes. 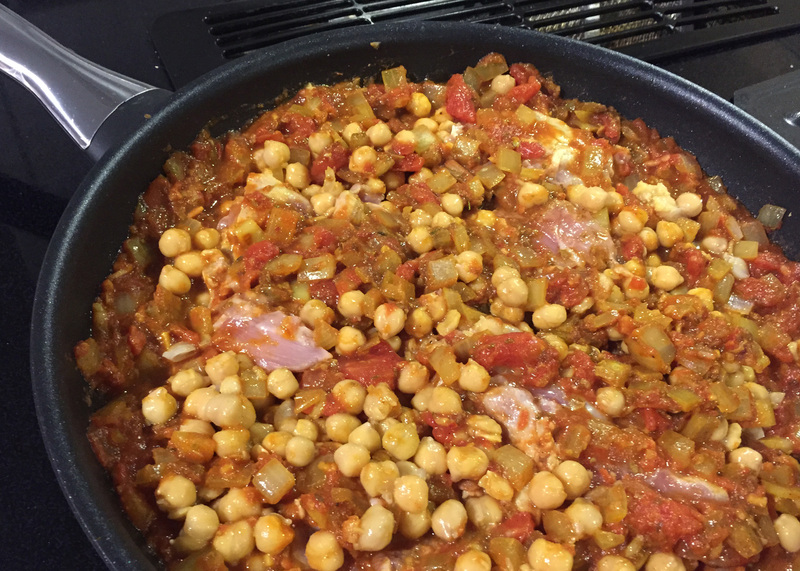 Your goal here is to warm the chickpeas and start heating the thighs to give the slow cooking a bit of a head start. Add all the pan ingredients to your slow cooker and turn on low for 4 hours. 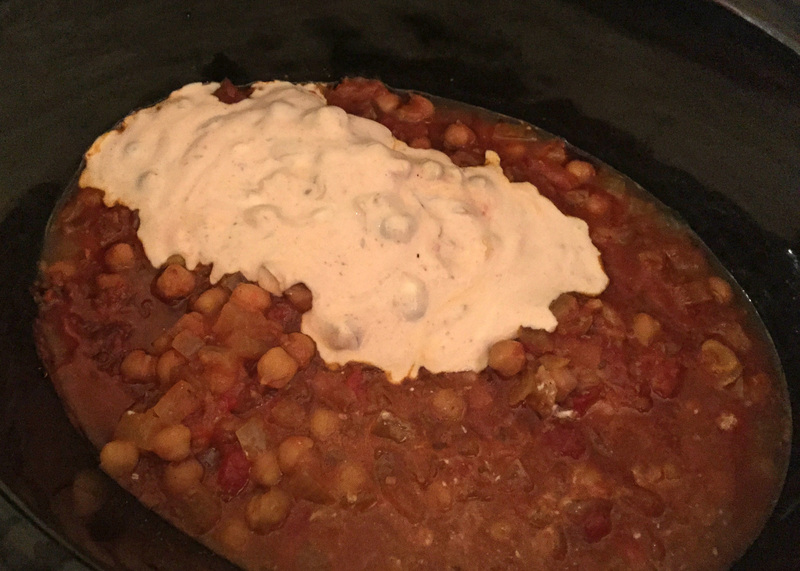 At the 3 1/2 hour mark (30 minutes before you plan to eat), put the sour cream into a small bowl or measuring cup, scoop a couple spoonfuls of the hot tomato-y sauce from the slow cooker into it and stir well (you’re tempering your sour cream so it won’t curdle when heated). Add the sour cream mixture into the slow cooker and stir. Continue to cook for another 30 minutes. When you’re ready for dinner, pull the chicken apart in the curry with a couple of forks. Sprinkle with cilantro and serve with naan or rice. I have been DYING to try a rendang (essentially a fragrant, spicy beef stew) for a while but it’s just been too darned hot to turn on the oven or stand over a burner for several hours. Then a miracle happened (really, really). 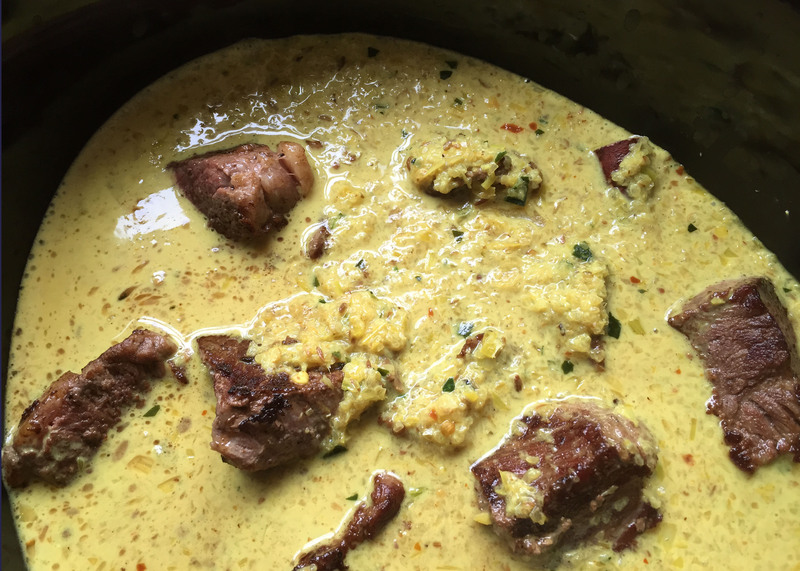 A rendang recipe https://sortedfood.com/recipe/6297 appeared in my “in box” on the exact day the temperature dropped 10 degrees and it used a slow cooker to boot! No oven or hot stovetop! See?? ?… a miracle! And guess what, the results were even better than I had hoped. I am still smarting after Husband’s remark last week about “bland”. Well, things were far from bland tonight, buddy! Cha-Ching! I don’t know about you, but I keep frozen lemongrass and lime leaves in my freezer (a habit from the “olden days” when these ingredients weren’t so easy to find) so I had most of the ingredients on hand except fresh red chillies for which I substituted red chilli flakes, and red onion for which I substituted white. I cut back dramatically on the salt and added fish sauce for an additional umami, funky sort of flavour. 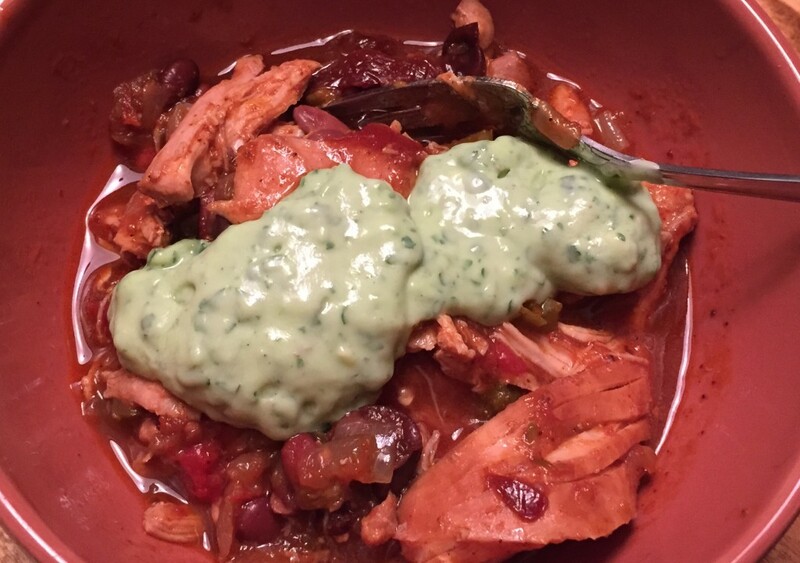 I’m calling this recipe “not authentic” because, slow cooker. For any traditional nay-sayers out there, I’m sorry you have to wait until winter for your rendang fix. That said, I DO think the inspiration recipe ends too soon. Traditional beef rendang is quite dry and for anyone who has ever used a slow cooker, you know the longer you cook, the saucier it seems to get. So after about 5 hours when the meat was falling apart tender, I removed it to a separate bowl, skimmed the fat, and cooked down the sauce on the stovetop to about half its original volume. I then adjusted the seasoning by adding a touch of brown sugar, another splash of fish sauce, and a tipple of sambal oelek for some instant heat. Easy peasy and Husband loved it. The original recipe says it serves 4… not in our house. I know this recipe will be going into my regular rotation. 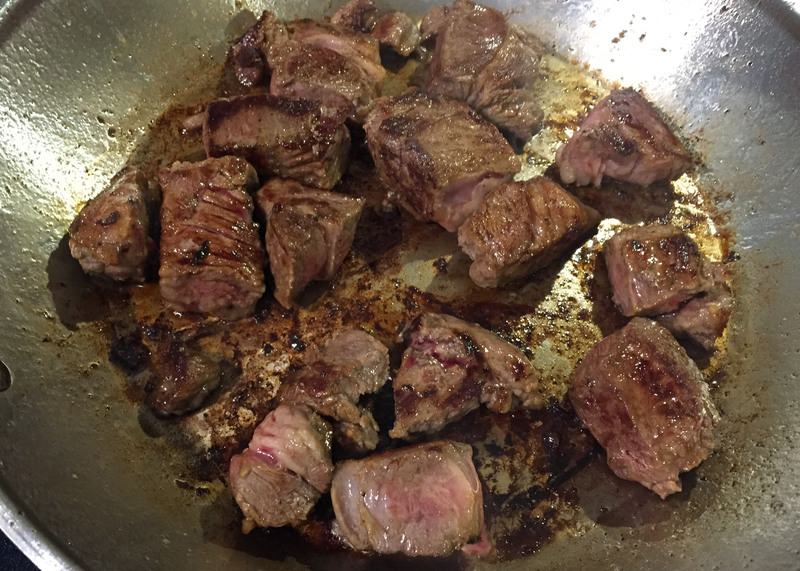 Cut the beef into bite-sized pieces, heat vegetable oil in a pan and sear in batches until the outside of the beef is a lovely dark brown. Transfer the beef to a slow cooker as it’s done. Do not wipe the pan clean. 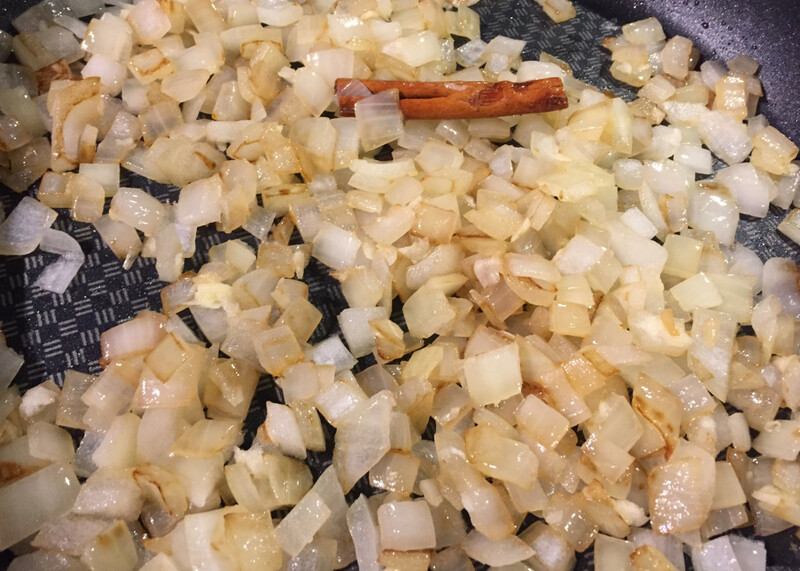 You will be pulling up all that beautiful caramelized flavour in the next step. Peel and roughly chop the onion, garlic, ginger, lemongrass and chillies (or chilli flakes). 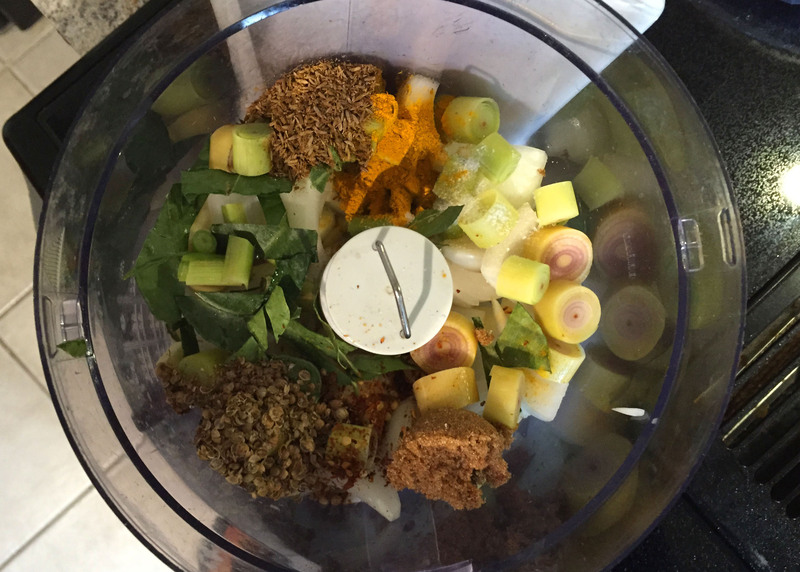 Throw them all into the food processor with the kaffir lime leaves, spices and palm or brown sugar. Blitz to a paste. 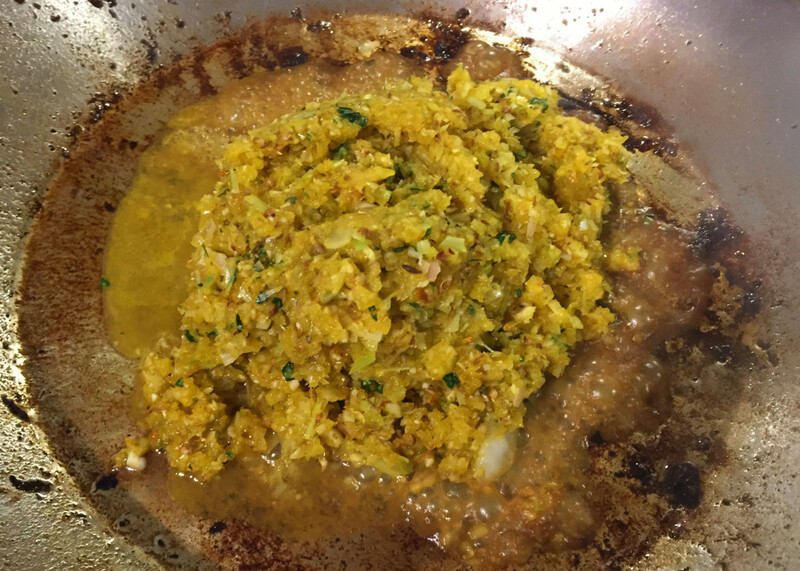 Add another glug of oil to the pan you used to brown the beef and add spice paste, frying for 2-3 minutes. Add the coconut milk, fish sauce and cinnamon stick and gently scrape up all the goodness at the bottom of the pan. Add the paste/coconut milk mixture into the slow-cooker with the beef and cook on a low heat for 5-6 hours until the meat is really tender. Remove the beef to a separate bowl and pour the remaining sauce from the slow cooker into a sauce pan on your stovetop (skimming the fat if you wish). I had about 4 cups of sauce. Add the tamarind paste, bring to a slow boil and reduce to approximately 2 cups of sauce, ensure you are stirring every few minutes so the bottom doesn’t burn. Taste and re-season if necessary. Add the cooked beef back into the sauce and heat through. 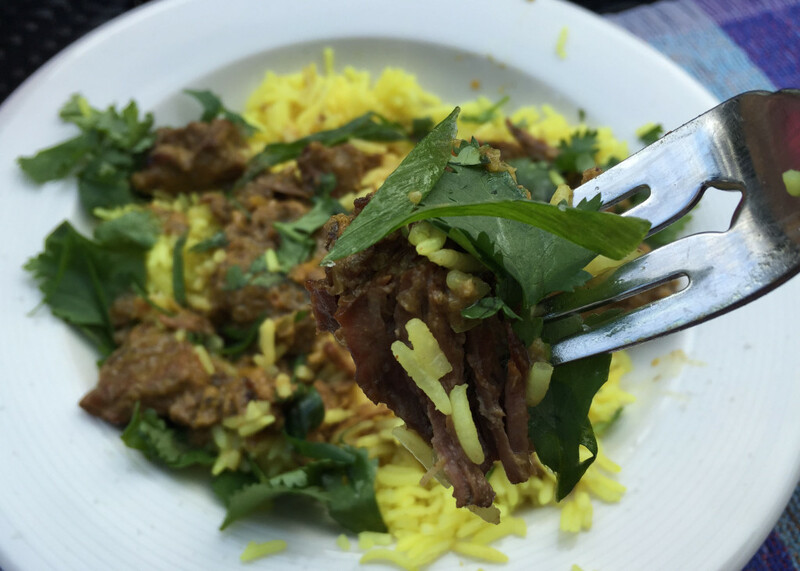 Serve with aromatic rice (I used basmati and added a pinch of turmeric, a few cardamom pods, and a star anise). Garnish with chopped cilantro, finely sliced green onion, and a wedge of lime. Ok, let’s be honest. This is not the type of recipe I planned to post when I dreamed of having a food blog. First, I’m still trying to love my slow cooker; b) I am in the middle of trying to dump my Christmas weight; and 3… well, there is no 3 except that I have made this 3 times in the past few weeks and both Husband and I really really like it. Seriously. It’s healthy enough to eat post-Christmas but I have not stooped to using that dry, tasteless protein known as the (dreaded) chicken breast. My version uses the ever-so-much-more-luscious chicken thighs (you know what I’m talking about) and still comes in at under 300 calories per serving. It also has a lovely bright zesty topping. Cha-ching!